As a known biennial event, the International Symposium on Programming and Systems (ISPS) returned again this year for the 11th edition. 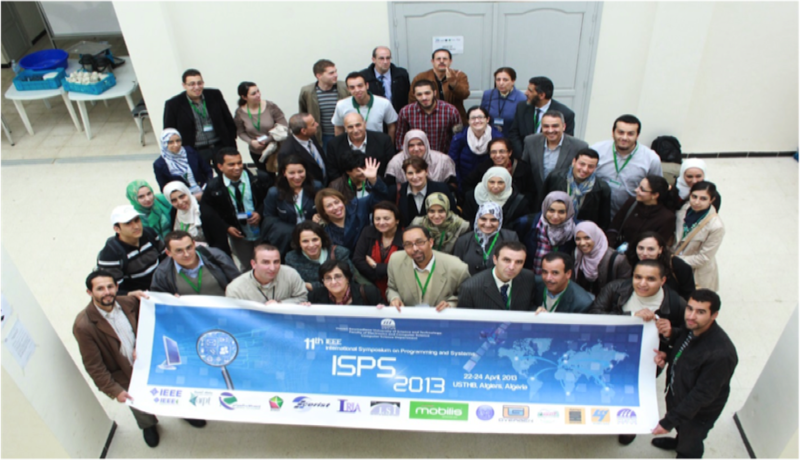 This year, the event was organised and hosted by the department of Computer Science at the University of Science and Technology Houari Boumediene (USTHB) from the 22th to 24th of April, 2013. Since its very first edition in 1991, the growth of this event has been steady and remarkable. The previous edition, held in April 2011, earned the IEEE label and the conference papers were indexed through IEEE Xplore. For the 2013 edition, we also received the technical sponsorship of IEEE subsection in Algeria, thus ensuring the continuity of this high quality conference. The ISPS 2013 was chaired by Prof. Ahmed Guessoum (USTHB University) and benefited from the expertise of an international committee of quality technical reviewers. The Program Committee was chaired by Prof. Yassine Djouadi, (USTHB University) and the organization committee, composed of several lecturers, research fellows and PhD students and headed by Dr. Abdelhakim Aitzai (USTHB, University), worked tirelessly and vigilantly to ensure the success of the event and reflected our commitment to strive for research quality of the highest caliber. The symposium gathered top researchers in computer science from all over the world, with particular expertise in programming and systems, which indeed gave a chance to create fruitful discussions among computer scientists from various domains and consequently opened avenues to exchange ideas and build platforms for potential collaborations. We were honoured to welcome five top-quality speakers who gave interesting presentations in key areas of computing, showing new avenues of research and presenting their state-of-the art results. Dr. Yacine Atif (UAE University, Program Chair at the College of Information Technology Since 1999), gave a presentation titled “Towards the Social Web of Things”. Dr. Yacine Atif made a number of research contributions particularly in the areas of Learning Technology and Social Web. He is also involved in the Technical Programs of several research forums. In his keynote, Dr Atif proposed a novel concept for physical objects and services to be easily accessible and shared in a web ecosystem, the communication mechanisms of which emulate the information-sharing tools commonly utilised via the conventional online social networks. He suggested that this may have groundbreaking implications on the evolution of the digital world as well as our perception and use of social web ecosystems. Another major highlight of the event was the talk titled “Internet of Things – Smarter Solutions, Smarter Spaces” presented by Dr. Hossam Hassanein, a leading authority in the areas of broadband, wireless and mobile networks architecture, protocols, control and performance evaluation. Dr.Hassanein is the founder and director of the Telecommunications Research (TR) Lab at Queen’s University School of Computing, with extensive international academic and industrial collaborations. He is also a senior member of the IEEE. Dr.Hassanein presented the concept of internet of things (IoT) and how it was opening new horizons in systems intelligence, where physical objects can interact with other objects through the global infrastructure of wireless/wired Internet. The talk also covered some of the activities at the Telecommunication Research lab at Queen’s University towards the realization of true smart spaces. The speaker introduced the design and implementation of a Smart Spaces framework that utilizes the social context. “In order to manage services and sessions, we integrate our system with the IP Multimedia Subsystem”, said Dr. Hassanein. In his talk, Dr.Hassanein showed that IoT offers many opportunities, among which are smarter solutions and spaces. With his unique outstanding and simplistic way of going through very clear slides animated with videos, the speaker effortlessly caught the interest of all attendees without exception. Dr. Hassanin made us travel to the future and see how things could organize themselves without the need to interact with human beings to make life appear with a new vision and a new perspective. The very positive feedback and the endless flow of questions of the curious audience reflected how engaging and novel the concept was. This year’s edition was also marked by the presentation given by the founder of the Laboratory of Systems Biology and Bioinformatics, at the University of Tehran. Dr Ali Masoudi-Nejad (Ph.D. in genomics from Kyoto University, Japan and associate professor of systems biology and bioinformatics). His main research interest focuses on computational systems biology, analysis of biological networks, network motif, RNAi pathway integration and cancer modeling. The talk titled “System Biology: Making sense of the biological system by Integrating of Post-Genomics High-Throughput Data” was one of the topics that attracted a large audience. In this talk, Dr. Nejad gave an overview of systems biology and presented its main aim which consists of holistic description and understanding of biological processes by integrating analytical experimental approaches with synthetic computational models. He pointed to the complexity of cellular networks and showed how researchers turned to computer simulation and the development of more theory-based approaches to augment and help in the development of a fully quantitative understanding of cellular dynamics. Dr. Nejad highlighted some of the important systems biology concepts, modeling algorithms, software tools, and emerging standards for representing, simulating and analyzing cellular networks. To answer the questions posed on the possibility of working in this research field, Dr. Najad summarized his vast experience by saying “I have a lab of bioinformatics composed of 19 Ph.D and Master students with different backgrounds. It took me 4 years to properly establish my group, and from my experience, I can guarantee it is easier for computer scientists to be bioinformaticians than for biologists, because the programmers only need to know a few things about biology depending upon the problems they are dealing with, whereas it is harder for biologists to learn computer science”. Prof. Salima Hassas from University Claude Bernard – Lyon was present with her talk “Engineering Self-Organizing Systems: Cognition and emergence of control”. Prof. Hassas leads a research group on Multi-Agents Systems and Self-organizing Systems. She initiated the Multi-Agents research field in Lyon since 1998. She is also an associate editor of the ACM TAAS Journal and has been appointed as an expert for several FP7 European Programs. In her presentation, Prof. Hassas first gave an overview of some definitions related to self-organization and their implications in engineering self-organizing systems. She particularly emphasised on self-organization in the context of multi-agent systems and presented an interesting idea developed in the domain of cognitive psychology and based on the “natural” origin of the self-organization phenomenon. Prof. Hassas took inspiration from nature to design/engineer self-organizing systems, and draw some principles for going beyond the mere transposition of metaphors to computational models. She illustrated the presented concepts that underlie the phenomenon of self-organization on some applications in the context of networked systems (Web, tagging & social networks, P2P, etc.) A lot of importance has been given to the talk of Prof Hassas, and a very positive reaction has been remarked from the audience. “From Fundamental Research to Successful Commercialization: Steps, Risk, and Challenges” was the talk given by Dr. Maha Saadi Achour Polyceed Founder and CEO San Diego, USA. Dr. Achour brings over 20 years of proven success in the design, development, manufacturing, management and marketing of microwave, and optical communication systems and subsystems. During her professional experience, Dr. Saadi created, developed, and marketed technologies and products to consumer electronics and telecommunication system providers using direct sale and licensing business models. Her talk covered the role of Academic Fundamental Research in building startups. She explained how visionaries and entrepreneurs help commercialize breakthrough technologies and confirmed that the main key is to work closely with university professors and their technology transfer offices. Another point stressed by Dr. Saadi was the importance of starting from target markets and working backwards to quantify potential opportunity and position the innovative technology against ongoing solutions and product roadmaps. Dr.Saadi covered Rayspan’s successful commercialization of metamaterial structures in wireless communication and its journey from a concept to the first commercial product. Dr. Saadi focused in her talk especially on students. Before she started, she asked all students to stand up to visualise their attendance and she was surprised by the number of PhD, Master and even undergraduate students who were present. During all her presentation, Dr. Saadi was repeating one sentence every single time: “Students, You are our Future.” The inspiration given by Dr. Maha Saadi to the audience made her talk very special, students have shown a big resonance with her and were very motivated for commercialisation as much as for research. She promised students to come back again to USTHB especially for them to take part in an informal discussion about their problems, their research and their aspirations. Effectively, this is what was happened just a week after the event. Before the closing ceremony, a panel discussion was programmed under the supervision of the principal of the University, with the participation of Dr. Saadi, Miss Bedjaoui (cyber-parc Sidi Abdallah, Zeralda), Mr. Tihal (Sonatrach) and Prof. Nacer (USTHB). The discussion focused on the relationship between the university and industry, on how to create collaborations between researchers and the industrial world, what the challenges are, the potential pitfalls and the measures to be undertaken to render such collaborations successful. What was unanimously agreed by all participants on the panel was that the programs offered by the university should be studied and organized by both parties (universities and companies). Industry innovation needs new ideas, and for this, it is vital for it to get closer to university education and research. The outstanding presentations of the distinguished speakers, and the large number of accepted papers of the highest caliber ensured that ISPS 2013 animated at the Cyberspace of USTHB was the perfect event to provide excellent exchange between experts, researchers and a lot of students. The conference proceedings covered several important areas of research in computer science submissions went through a double-blind review process. Best paper awards prizes were given to the first author of three selected papers. The 3rd Prize was given to the paper titled “1DLBP and PCA for Face Recognition” by Mr Benzaoui Amir and Mr Boukrouche Abdelhani (University of Guelma, Algeria). The authors proposed a new algorithm for face recognition. This algorithm is mainly based on LBP texture analysis in one dimensional space 1DLBP and Principal Component Analysis PCA as a technique for dimensionalities reduction. The 2nd prize went to Mr Omar Rafik Merad Boudia and Mr Mohammed Feham (University of Tlemcen, Algeria), for their paper “The impact of ECC’s scalar multiplication on wireless sensor networks”. Elliptic Curve Cryptography (ECC) is a public key approach that represents one of solution and even a serious candidate for providing security in wireless sensor networks (WSN). The most expensive operation in ECC is scalar point multiplication (SPM). However, the ECC based schemes depend strongly on the performance of SPM. In this paper, the authors focused on scalar point multiplication, its efficiency and its security against SCA (in particular simple power analysis). The first prize went to Mr Nouredine Tamani (UMR IATE INRA/SupAgro, France), Mr Ludovic Lietard and Mr Daniel Rocacher (IRISA/ENSSAT/Univ. Rennes, France) for their paper which was titled “Ontology-Based Evaluation of Fuzzy Bipolar Conjunctive Queries over Relational Databases”. In this paper, the authors introduced the user query evaluation process, under the extension of their flexible querying framework to bipolar conditions of the form”or else”. Three algorithms were developed in order to perform applicable substitutions, to derive corresponding complementary queries and to translate them into Bipolar SQLf statements. The feasibility of the approach was shown through a prototype developed in the field of ultimodal transport systems. Mr Nouredine Tamani received his price from the principal of the USTHB university Prof. Benali Benzaghou. Before announcing the official end of this 11th edition of ISPS conference, our invited speakers had their share of honours as well. Symbolic gifts were given to our guests to commemorate their visit to Algeria and to shown them our gratitude for accepting our invitation to participate in this interesting event. They had indeed enriched the conference with useful lectures with their suspenseful ways that added to the success of this event. In return, our invited speakers expressed their great thanks for the invitation. They also expressed their happiness to visit Algeria and experience close interactions with the Algerian professors and students. Indeed, the whole three days conference was an atmosphere infused with fun and knowledge sharing. For us, ISPS 2013 was an unforgettable edition. Its success was the result of the collaboration between different participants; from our sponsors to our speakers, and everyone present, we thank them all. The 11th edition of ISPS in 2013 marked its name in the history of this famous conference by the testimony of our invited experts from all over the world and all our guests “You have set the bar very high”, they told us, “the bar of the quality of the organization and, above all, your working together in a friendly atmosphere of cooperation”. Such encouragement makes us so proud and at same time we consider it a stimulating factor that will push us to work harder and better for the upcoming editions, to build upon this success, not only for our university but also for our country. 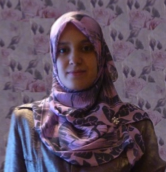 Aicha Boutorh is a computer science Ph.D student at the Laboratory of Research in Artificial Intelligence (LRIA), University of Science and Technology Houari Bommediene (USTHB) in Algiers. She holds a master degree specializing in Intelligent Systems from the same university, and is currently working on Bioinformatics research in collaboration with the Artificial Intelligence group in the Computer Laboratory, University of Cambridge, UK. I am very pleased to get this english magazine so we can build throug it a new bridge of knowledge , by the way i would like to inform you that lately i wrote a document 03 pages on the last opep confrence so i explianed some conflicts that led or pushed the opep members to that greement. if you are interested on that, please let me know.